Beetroot does this thing where it colours everything around it crimson with its juices. My fingers, the wooden spoon, the new(ish) tea towels……et al. I can’t decide whether it’s very cool or very obnoxious. 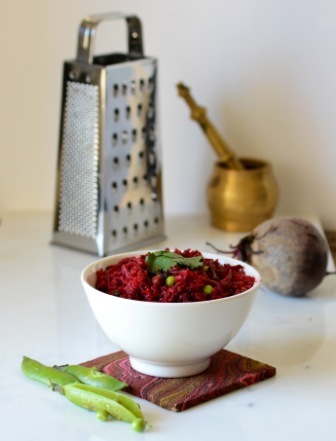 And rice…..well rice doesn’t stand a chance against beet juice, what with being white and all. It’s a blank canvas for redness. This is a super simple, quick weekday meal. My solution to having nothing in the vegetable crisper drawer except a single lone beet, and a container of cooked rice that needed a good home. I think we’ll keep this one on the dinner rotation. 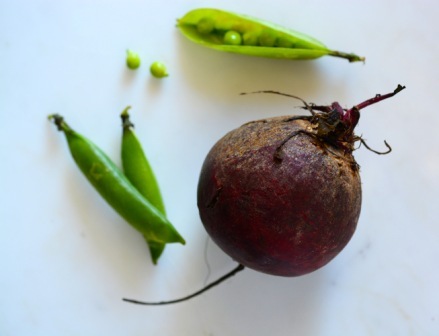 The beets provide fibre and a touch of sweetness which is nicely contrasted by the chilli. 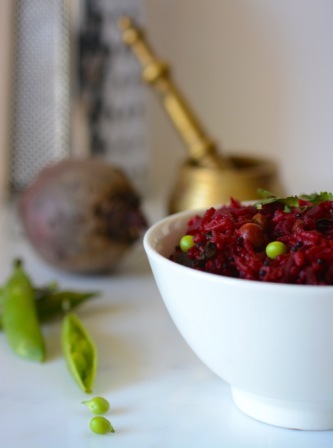 The rice makes it a filling weekday meal which is super quick to make. Did I say that already? Well it is……it took me longer to take photos of this dish than it did to make it. If you do not have rice which is already cooked, cook the rice using your favourite method. Spread the cooked rice out on a large tray to cool. Peel the beetroot and julienne- I use a mandolin for this. 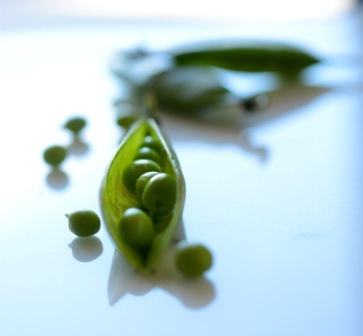 If using fresh peas, cook in boiling water for 5-10 minutes. If using frozen peas, just soak in boiled water for a few mins. Heat the oil in a non-stick wok or fry pan. Turn the heat down and add the mustard seeds and cover while they pop. Add the dhals and fry until they are slightly browned. Add the spices and fry for 2-3 mins. Then, add the chilli and curry leaves and fry until the leaves are browned. Read more about tempering spices here. Throw in the beetroot, 1 tsp salt and about 1/2 cup water. Stir through and cover the pan. Cook on low to moderate heat for 4-5 mins until the beetroot is tender but still firm. Drain the peas and add to the pan, as well as the rice. You may have to break up the rice with your fingers. Continue to toss everything together until it is all coated in the spices and oil, and heated through. Be gentle with the rice so it doesn’t go squishy. Taste and add more salt if needed. Squeeze about a tsp of lemon juice over the top. Toss through again and serve sprinkled with chopped fresh coriander and yogurt on the side. The dhals are probably optional but they do add a nice crunch. 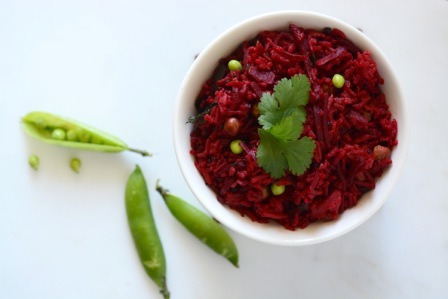 I do yogurt rice with that tempering often, but adding beets and peas, thats totally original! Maybe when I find myself with a lone beet, I’ll remember your trick! BTW, wanted to point out that the website loads onto my IE browser pretty weird, all the logos and links are garbled and superimposed. So right now I can see this comment box but also your about & contact and glossary links in the comment box. Hope you dont mind me pointing it out – maybe something to look into – or possibly my browser is so old the current sites aren’t compatible? Just letting you know! Hi Archana, yeah others have said that but on my browser it’s fine. Will definitely look into it though, thanks so much for letting me know. I much prefer people to tell me so I can at least try to fix it, so much appreciated. How are you enjoying blogging? I’m loving blogging, seems to be taking over my life 🙂 I’ve always read a lot of blogs, for years, but writing my own is something else. My brain is wired, constantly thinking up posts and recipes and I find myself cooking with a lot more enthusiasm.. I hope I can sustain it ! I do love a good fridge surprise dinner! Great combo! Thanks JJ! Yeah it feels like a bit of achievement to make something good out of whatever if kicking around in the fridge.